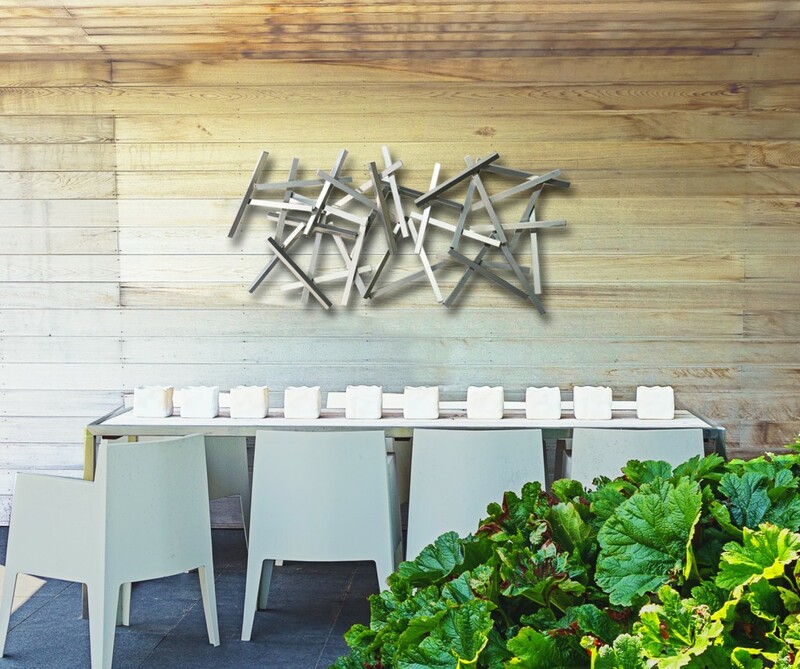 Estrella, silver powdercoated aluminium, is one of the abstract wall sculptures in the new collection by Terra Sculpture. In response to the many requests of our collectors and clients, Terra Sculpture is thrilled to announce our debut collection of modern abstract wall sculpture. These compelling and energetic pieces are created to transform both exterior and interior environments. “All of the wall sculptures are intended to create a conversation between art and space,” says Terra Sculpture artist Jennifer Asher. While our standing sculptures are most often displayed outdoors and placed upright in the landscape, our wall sculptures are more open to interpretation. The new collection continues our exploration of sculptural form and light, but this time from a different perspective. Talisman, stainless steel and powdercoated steel, is one of the new abstract wall sculptures in the collection by Terra Sculpture. 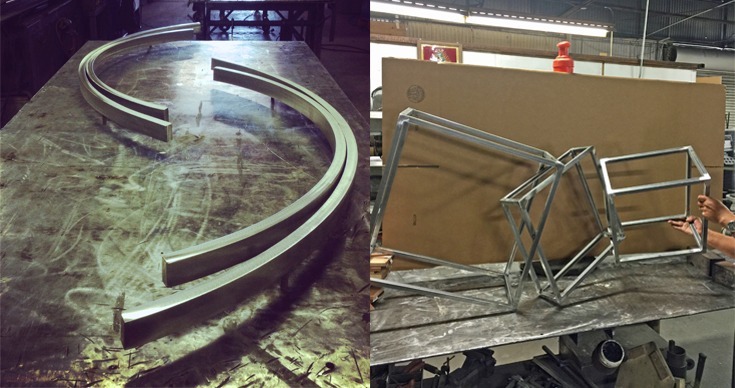 While the design process for standing and wall mounted sculptures is similar, the force of gravity plays an important role in creating (and engineering) pieces that hang or are suspended from the wall. Asher explains, “Our work begins with sketches and from there we create wood maquettes. But unlike standing sculpture, wall sculpture makes use of the vertical plane where the actual wall becomes a design element.” Wall sculptures are then composed using the flat surface of a large studio work table where the sculpture comes to life. 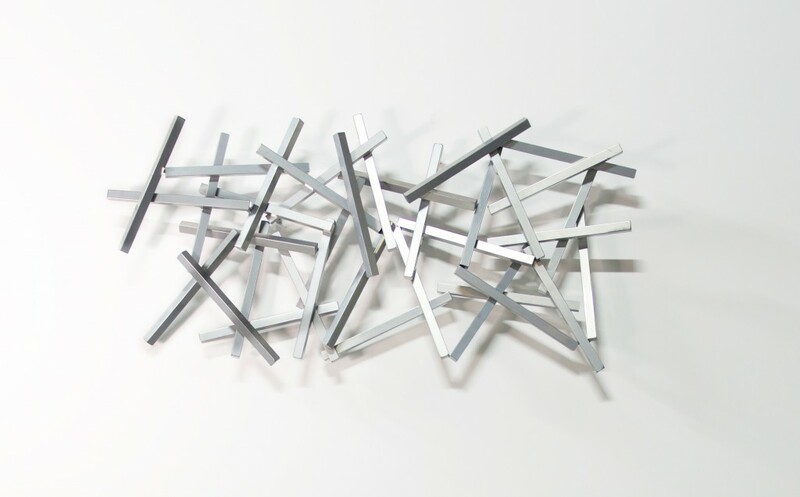 Abstract wall sculptures Time and Gesture are new works by Terra Sculpture that are crafted on the studio work table. Our new collection of modern wall sculpture explores the expression that comes from light and shadow. 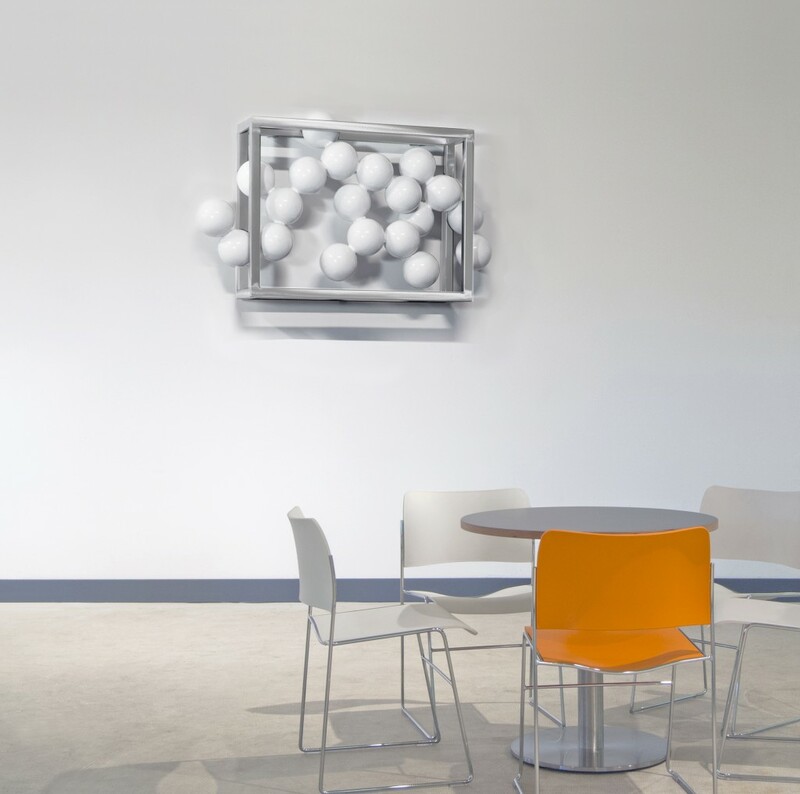 The powdercoated aluminum sculpture, Estrella, resulted in more playful movement because of it’s lighter quality and almost dances off the wall. 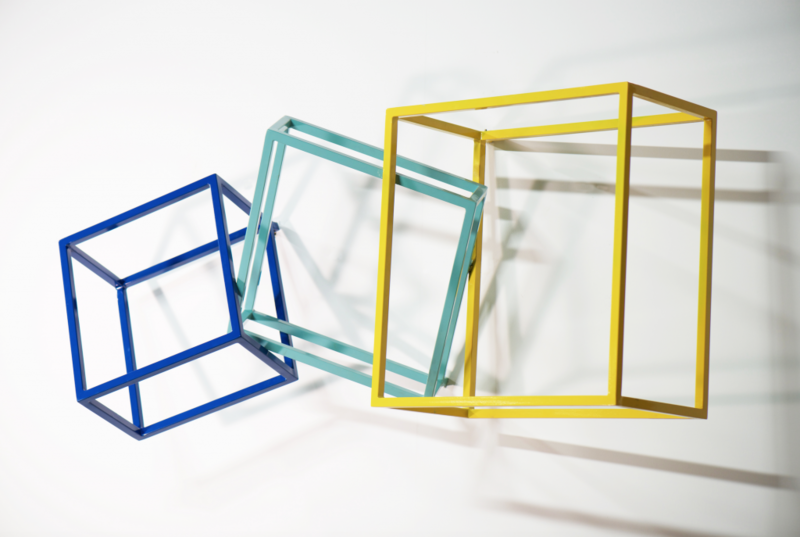 The interlocking colorful steel cubes of Gesture create playful floating geometry where shadows become part of the sculpture’s composition. Mudra, while similar in form and material to Kismet, was inspired by an elegant yoga hand pose. 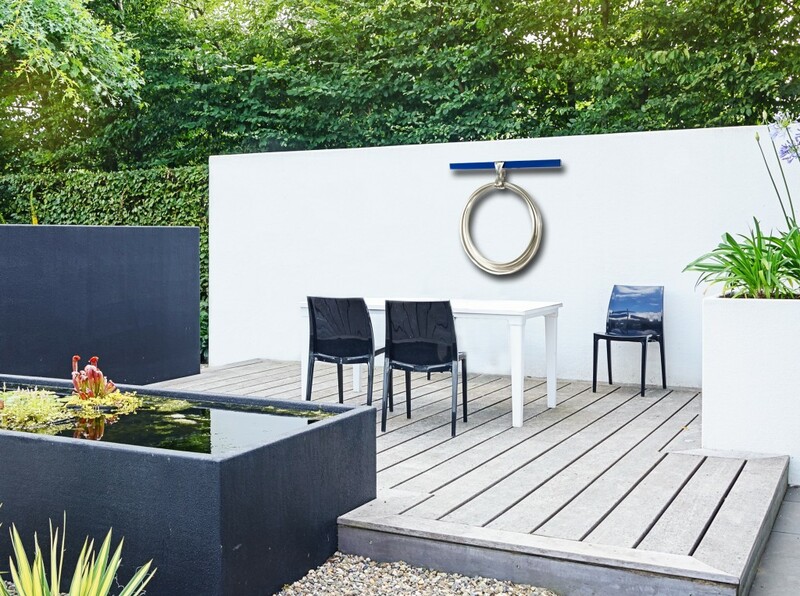 Time and Talisman, both graceful stainless steel wall sculptures, interpret and symbolize the infinite. 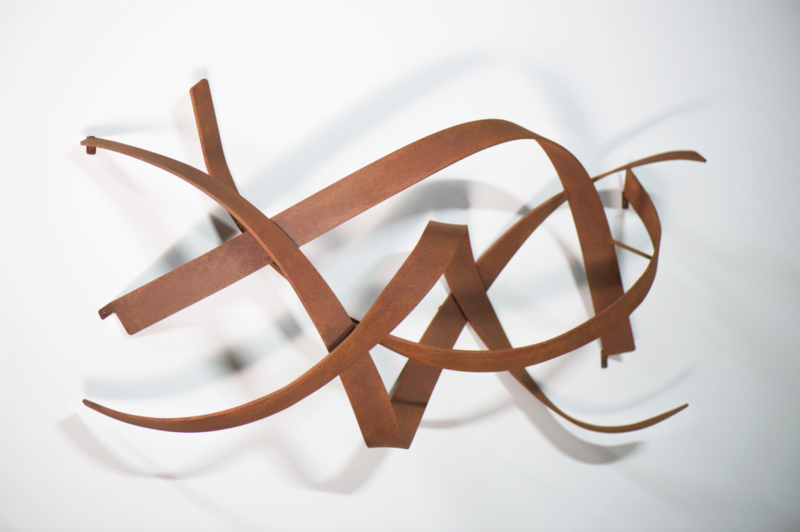 Mudra, weathered steel, plays with light and shadow and is one of the new abstract wall sculptures by Terra Sculpture. As always, geometry plays an important role in our work. Gesture and Clarity reflect on the layering of three dimensional shapes, giving them the ability to transform a space into an experience. Wall shadows created by Gesture, a powdercoated steel sculpture, are part of the composition of this abstract wall sculpture in the new collection by Terra Sculpture. View the entire collection on TerraSculpture. Clarity, stainless steel and powdercoated steel spheres, is one of the abstract wall sculptures in the new collection by Terra Sculpture. Elizabeth Stilwell is a freelance writer, designer, and illustrator based in NYC. ​She ​is also co-founder the Ethical Writers Coalition, a group of writers working together to further ethical and sustainable living online and in print. You can see more of ​her work​ ​here.